Each year we recognize a member highway carrier that has most significantly impacted our communities through their support of our partner charities. 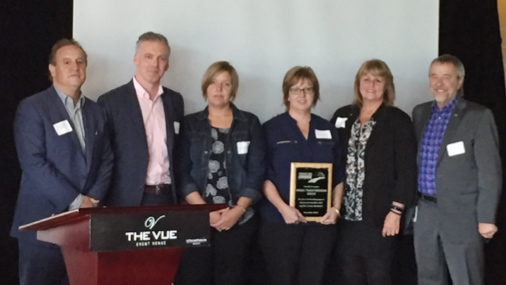 This year at our October 11 AGM, KRISKA TRANSPORTATION GROUP was recognized for its exceptional contributions to charity over the past 12 months, during which the Kriska team helped many of our partner charities with reduced-cost transportation and temporary warehousing services. In addition, teams of employees from Kriska Transport and its sister carriers Transpro Freight Systems and Mill Creek Motor Freight participated as volunteers in two T4C volunteering events: our annual Team Build Day with Habitat for Humanity Kitchener-Waterloo, and our Trucking Industry Food Sort Challenge in support of Toronto’s Daily Bread Food Bank. We thank the Kriska team for generously and reliably supporting our communities and Canadians in need with the 2018 Member Highway Carrier of the Year award!